Dirt bike rider going down a hill on a dirt track. I am often asked “which” or.. “what dirt bike should I buy/get?” Usually, that’s followed by very little information about what style of riding you want to be doing, your experience level, size etc. So with your questions in mind, and in an attempt to deflect a number of emails I receive regarding this topic, I have put together this page. Fortunately for you and I, we have a great variety of dirt bikes to choose from today. The question is which one do YOU choose? There is a good reason why they come in varying sizes and shapes with different engine types and designs. The best bike for you boils down to what it is you want it for and your individual circumstances or needs. Carefully consider the following tips before buying your next dirt bike. What style of riding do you want it for?Will you be riding on trails through forests? Are you looking to get into long distance enduro riding? Maybe you’re thinking about racing motocross or supercross? 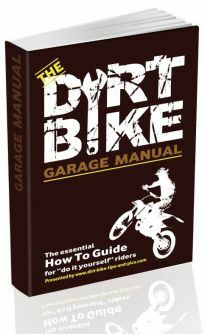 You can buy a purpose built dirt bike for all of those types of riding. You don’t do your riding skills or level of enjoyment any favors by buying a motocross bike that is designed for the track, and riding it on tight, tree-root filled trails. That’s what trail bikes are made for!Basically, there are two different types of dirt bikes. Motocross/Supercross bikes (think Olympic sprinter), and enduro/trail bikes (think long distance marathon runner). The bikes may look similar but they are very different from each other.Motocross bikes e.g. KXF 250, KTM 250, RMZ 450, CRF 450R are built for rapid acceleration and big jumps – track racing. Enduro and trail bikes e.g. KLX 450R, KTM 530EXC, Gas Gas 300EC, CRF 250X are built for bush bashing and trail riding. They are made for traveling long distances offering a smoother ride over rough terrain and they’re able to tackle smaller jumps than MX bikes. Differences such as the gearing, ergonomics, fuel tank capacity, suspension and added features like lights make each type of dirt bike the ideal bike for its intended use. What size dirt bike should I get?This depends on 3 things. Your height and weight. Your riding experience. And what you want it for.The fact that you are reading this tells me that you probably don’t have much experience in riding dirt bikes. That’s cool, but think seriously about what I’m about to say before rushing out and buying the latest, fastest big bore… Your safety, enjoyment and speed decrease when you ride a bike that is too powerful for you! How do I know? I’ve been there, and many other experienced riders have too. It requires tremendous skill, strength and stamina to ride a powerful bike at full noise. A less powerful pony is much easier to control and maneuver, therefore you will have more fun and actually ride faster at the same time.Regarding your height and weight, you want to be able to have both feet touching the ground when mounted. This is a good indication that the bike is the right size for you. If you are weighing in at a cool 120kg plus, you will need something with a bit more grunt than a 125cc two-stroke or a 250 four-stroke – otherwise you’re gonna kill that poor thing!Again, what do you want it for? If you’re riding in sand and up steep hills you’ll need to buy a bike with more power to handle those types of conditions. What is your budget?How much money are you willing to throw at this? If money isn’t an issue then buy whatever suits you – you lucky thing. If however, you aren’t Mr. Money Bags I’ll make it pretty easy for you… Two-strokes are easier and cheaper to maintain than modern four-strokes – by a long shot! Which brand of dirt bike should I buy?What’s your favorite color? That’s pretty much the only big difference between most of the dirt bikes from the major manufacturers these days. Unless you’re a really good rider a certain brand is not going to make much difference to your riding ability or skill level from another. Although, KTM seem to put that extra touch on their bikes that make them worthy of the larger price tag.And one last tip. Avoid cheap Chinese dirt bikes like you would the middle seat on a plane full of Japanese sumo wrestlers. It will only end up in tears for you otherwise. 2 Stroke vs 4 Stroke: What's The Deal Anyway?